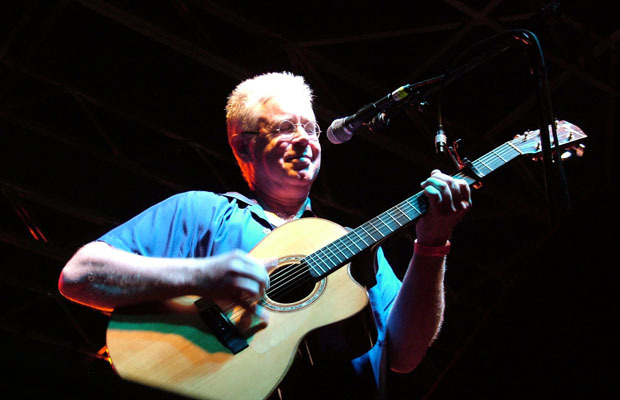 Bruce Douglas Cockburn is a renowned songwriter and guitarist, who has a career span of 40 years. Bruce has written several songs in various styles, ranging from jazz to folk and also rock and roll. Just like his diverse music style, his lyrics have also dealt a spectrum of subjects. His lyrics reflect his passion for politics, Christianity and human rights. In 2014, Rumors of Glory: A Memoir, was released by him. Spending most of his childhood years in Pembroke on a farm, Cockburn entered this world in 1945 – the end of World War II. In many interviews, the artist mentioned that the first guitar he had was in fact a discovery in the attic of his grandmother’s house, during the late 1950s, which Bruce decorated with golden colored stars and played the instrument alongside what was rolling on radio. At the Neapen High School, Cockburn studied but he didn’t take any music classes. However, in a 1964 photograph printed in the year book, he stated his desire of becoming of musician. Later he joined the Berklee School of Music, situated in Boston. By 1966, he was mature enough in the field to joined The Children, a band in Ottawa, which remained intact for around one year. After this, he united with The Esquires and later when he shifted to Toronto, he formed The Flying Circus with Marty Fisher, Neil Lillie, Gordon MacBain and Bobby Kris. While Bruce was renowned in Canada for his music, he did make a great impression in America until the late 1970s, when he released Dancing in the Dragon’s Jaws. One of the tracks from this album, titled Wondering Where the Lions Are, ranked at 21 on U.S. Billboard Hot Hundred in 1980. As a result he was invited to Saturday Night Live on NBC. Cockborn’s lyrics changed with time, from urban to global and political to progressive. The singer has travelled to several countries, like Iraq and Mozambique, participating in concerts for charity. His songs revolved around subjects that range from land mines to International Monetary Fund, through music styles like Latin and reggae. Looking at his personal life, the singer was married in 1969 until 1980. From the marriage, Bruce has one daughter, who when was in the uterus, Bruce released a song named Little Seahorse. In 1998, much after his marriage, he travelled with Robert Lang, the filmmaker to West Africa. There, Cockburn, Toumani Diabate and Ali Farka Toure jammed sessions in a one month long tour. The journey was documented in a film called River of Sand, which was given the Regard Canadien in Montreal at a film festival. Eight years after the millennium, Romeo Dallaire, senator from Canada who is active in humanitarian activities, appeared with Cockburn in University of Victoria in a concert that was held to help eradicate the troubles of young soldiers. Afterwards, Bruce married M.J. Hannett, his girlfriend, after the birth of his another daughter in 2011. Since the start of 2014, the family has been living in an area in San Francisco. Prior to shifting to this state, a documentary was released about the music artist. Rewinding to his childhood, he loved music and enjoyed Christmas more than anyone around him. In fact, he released an album for this season. Whenever he talks about Christmas, Bruce remembers his parents slugging him out from under the kitchen table.